Coach Miguel is back with another Thursday soccer coaching tip. 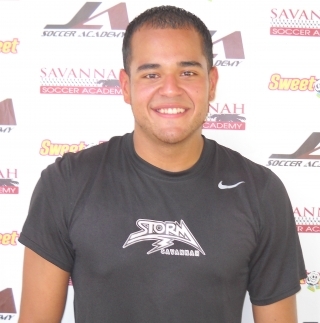 Coach Miguel has just registered for the NSCAA Premier Diploma and is beyond excited to take this course in January. It will be a fantastic time for him to continue his growth as a coach and a leader. For this post, Coach Miguel writes about giving detailed coaching points and how that leads to the correct game day coaching environment. When coaching your team, you should always let the game start to flow before making coaching points to the participants about their shape, first touch, and decision making. Be patient, let the players start to gain comfort with the ball so they can get in the flow of the game and then make possible corrections. Try your best not to control your players every move and every decision. We want the players to make their own decisions on the field and experiment with new ideas. You will give away some easy goals but the players will learn from their mi stakes and grow as players. As we know, winning is not the end goal but player development is. If we coach in the appropriate manner we can have both. Controlling your players every move does not allow them to develop on the field or to think for themselves. Do not coach the player on the ball. Instead, focus on coaching the players off the ball. Coaching the player on the ball is extremely distracting to allowing them to make a decision for themselves. Coach the players off the ball and you will see how the player on the ball reacts. For example, when your center midfielder has the ball and you want them to play the ball to the forward; Ask your forward “Can you move into the open space at the proper time to receive the next pass.” Teaching the players off the ball the appropriate shape to be in to receive the next pass or offer support allows them to learn while the player on the ball is allowed and encouraged to make a decision. Coach with detail when you make your coaching points. For example, if you have a forward that always turns into pressure and loses the ball, many coaches would say “STOP TURNING!! !” after the play was complete. A more appropriate statement with more details would be “Avoid turning when you are under pressure when you receive the ball. Instead, take a touch back into space, and connect with the next player you see that is open.” Giving a little more detail will help the players understand exactly what you want them to attempt to fix. I received these tips from other coaches when I was a young coach and they have worked out well for me over the course of the last four years. They really helped me learn to be a leader and a coach on the sidelines, and now I don’t coach the entire game. Pick good moments when to coach and speak with detail in order to improve players game play. Thanks for following the EducatedCoaches.com blog and have a great day! NSCAA Premier Diploma is a very good course. Hope you got a lot out of it.